Are you tired of watching TV, and in need of a form of entertainment that is more substantial, more intelligent, and actually makes your life better? Ted.com is one of the most life-changing information resources that exists, and a lot of smart people are using it to revolutionize their English. It has subtitle options for English, and nearly every other major language, so you can share it with your friends and family. So, here are 19 incredible Ted Talk videos that are definitely worth spreading. They will change the way you think about language learning, English, and life in general. Be sure to bookmark this article so you can come back and watch them one by one. Have fun learning! *NOTES: We’ve embedded the youtube video and included the Ted.com direct link below each video (we weren’t able to embed the Ted videos directly onto the page). 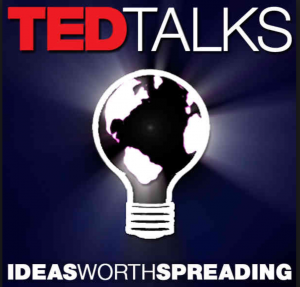 Follow the link labeled “Ted.com Link” to access subtitles in English and most major languages. The descriptions and biographies were taken from the Ted.com site. Using biological evolution as a template, Mark Pagel wonders how languages evolve. Growing up, Benny Lewis struggled with the English language and had to receive speech therapy.At age 21, and armed with a degree in electronic engineering, Benny moved to Spain and managed to spend six months in an “expat bubble” without ever learning to speak any Spanish. Everything changed one day when Benny an important decision to really try, and to ignore all of the empty excuses. It changed his life. Within just a few months he was confidently getting by in Spanish and eventually reached an excellent level of mastery in the language. Since then, he has continued his travels (eight years so far, with no home base) and learned more than a dozen languages, currently speaking eight of them at high fluency. You can learn more about Benny at his world-famous blog, www.fluentin3months.com. We also wrote an article about him! In her talk, longtime English teacher Patricia Ryan asks a provocative question: Is the world’s focus on English preventing the spread of great ideas in other languages? (For instance: what if Einstein had to pass the TOEFL?) It’s a passionate defense of translating and sharing ideas. As the CEO and co-founder of new online dictionary Wordnik, Erin McKean is reshaping not just dictionaries, but how we interact with language itself. Rajesh Rao is fascinated by “the mother of all crossword puzzles”: How to decipher the 4000 year old Indus script. At TED 2011 he tells how he is enlisting modern computational techniques to read the Indus language, the key piece to understanding this ancient civilization. Rajesh Rao seeks to understand the human brain through computational modeling, on two fronts: developing computer models of our minds, and using tech to decipher the 4,000-year-old script of the Indus valley civilization. Lost jobs, wayward lovers, wars and famine — come to think of it, just about any of life’s curveballs — there’s an aphorism for it, and James Geary’s got it. Susan Savage-Rumbaugh has made startling breakthroughs in her lifelong work with chimpanzees and bonobos, showing the animals to be adept in picking up language and other “intelligent” behaviors. Ethan Zuckerman studies how the world — the whole world — uses new media to share information and moods across cultures, languages and platforms. Murray Gell-Mann brings visibility to a crucial aspect of our existence that we can’t actually see. He won the Nobel Prize in physics for introducing quarks, one of the two fundamental ingredients for all matter in the universe. So that’s a comprehensive list of the best Ted Talks for language learners. We are always talking about these in the Real Life English International Community, and we would love to see you there. And we also use these to teach in our Free RLE Mini-Course we offer to our loyal readers. Think about how you can use Ted.com, and similar resources, to learn English in the most fun, practical, and convenient way. Remember, we learn best when we have fun! We’re here to help you do just that. Take care! Awesome list of videos Justin! Watching TedTalks is definitely a brilliant strategy to improve your English and your life!! I loved it.I´m an English teacher and I will certainly benefit from all these talks on my lessons.I´m sure my students will appreciate watching these fabulous videos. Valeria, I’m glad it was useful to you and your students! Thanks a lot for the nice comment. What are you looking for, and where are you from? GREAT VIDEOS! I use these videos in my teaching English. Thanks Justin ~ I enjoyed the videos very much. Although "Smash Fear, Learning Anything (Tim Ferris)" is very delightful because of his humorous way :), "Metaphorically Speaking (James Geary)" is my favorite here. It encouraged me a lot to hold on to certain writing styles I prefer because I'm interested in conveying images in a written language, which come up to my mind when I see, read, think of or experience something around me. Yeah !! That’s the best video i’ve ever seen. Seriously, I will think differently by watching these topics. Thank you so much for sharing these inspiring videos! I’ve been looking for TED videos with subtitles because my English is not first language and my listening skill is not good enough yet. Please continue uploading new TED videos. Thanks for your great work, again!